MAD RIVER TOWNSHIP — Six decades serving the public Mad River Township resident and Hustead Fire Chief William Young bided a final farewell. Young was honored by local officials, family, friends, and colleagues as he retired from service during a reception held June 7 at the Hustead Fire and EMS Station. “I’ve really appreciated the time here. Over the years, I have enjoyed working with a great group of dedicated volunteers, and they have become my extended family,” Young said. Young greeted a steady flow of well-wishers who filled the fire and EMS station at 6109 Springfield-Xenia Road to celebrate the fire chief’s career. He began his career in 1955 with Hustead Fire Department when he was just 16 years old. “What stands out to me most about Bill is the hours he has dedicated to this community. He has given a lifetime of service to the citizens of Mad River and Green Townships,” Estep said. Husted Fire Department Lt. and Green Township Trustee Brian Clem said Young always led by example and taught the firefighters to strive for a common goal which was to serve and protect the citizens of the two townships. “Bill has been a great chief for us, and it will be a tough job to replace him,” said Clem. Assistant Chief and Training Officer Larry Ridenour, who is currently serving as interim fire chief, praised Young for his exceptional leadership skills and noted that his patience was Young’s most prevailing quality. “I never saw him lose his temper as chief, and that is amazing. Bill was also a great teacher and always put his firefighters ahead of himself. It was truly an honor to work under his command,” Ridenour said. Enon and Mad River Township Deputy Chief Elmer Beard also commended Young for his long-standing commitment and decades of service. “I have known Bill for a long time, and he has been a very dedicated, well-liked fire chief,” said Beard. Just as the reception was getting underway, Hustead firefighters were dispatched to a local fire which according to Young’s wife, Rita, was representative of the lifestyle Young and his family have lived for the past 60 years. “For two years in a row, we were on our way to Christmas Eve services when the guys were called out to a fire. They dashed off to the fire, and the wives went on to the service,” Rita Young recounted with a chuckle. Upon returning to the firehouse, Young was honored by several speakers, including firefighter John Myer who served as the master of ceremonies. Myer, who is also a former Green Township trustee, commended Young for his strong work ethics which spanned more than four decades he served as fire chief. “Bill managed the budget like it was his own money and didn’t ask us to do anything he wouldn’t do,” said Myer. Green Township Trustee David Farrell praised Young’s 60-year commitment to the department, noting that 42 years in a leadership role was a major accomplishment and a true testament of Young’s outstanding service to the community. Mad River Township Trustees Joe Catanzaro, Kathy Estep, and Robert McClure Jr. also paid tribute to the fire chief for his many years of service. “It has been a real honor working with you. Your dedication is amazing, and your shoes will be hard to fill,” Catanzaro told Young. Several of Young’s friends and colleagues described the fire chief as a caring, exceptional leader who was the true backbone of the fire department. Myer and Ridenour also shared stories and rehashed memories of the chief’s reaction after a number of mishaps occurred involving several fire trucks. 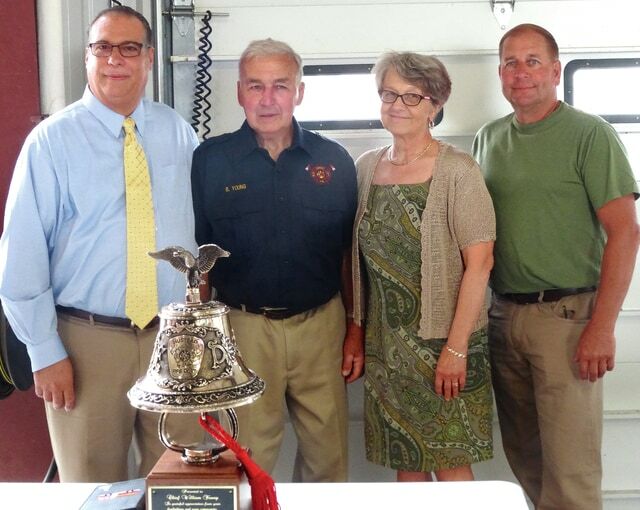 Young was honored with several retirement gifts, including a bronze fire bell mounted on a solid-wood base. Daniel Sutphen, director of sales for the Sutphen Corporation, also presented Young with a personalized retirement plaque, and Myer read a proclamation from Ohio Governor John Kasich thanking Young for six decades of loyal service to the Hustead community and Mad River and Green townships. The retiring fire chief thanked his family and coworkers for their support throughout the years and was filled with emotion when he took a moment to paid special tribute to his wife. Young also presented her with a bouquet of roses honoring her devotion and support over the years. As he left the podium and embarked on his journey of retirement, Young received a standing ovation. “I have wonderful memories and experiences that will go with me through life,” said Young.